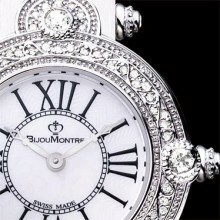 This Collection has revived the exquisite tastes of life during La Belle Epoque, Art Deco design of the 20s, which was successfully transferred to the harmonious and elegant jewelry watch. By then it was built using extravagant European lifestyle to distinguish sterling silver material, and then plated with precious rhodium to make a very fine portrait of the essence with antique jewelry. The watchcase, watch side, watch horn to watch back are full of exquisite carved figure ornaments and are inlaid with ancient aristocratic exclusive topaz, also titled "gold of gems" (1.80 carats). 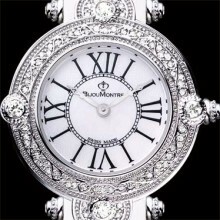 The watch dial bears simple Roman hour markers and totems, giving it "La Belle Epoque" kind of elegance. Top Wesselton / VS diamonds in total of 0.78 ct..
Topaz in total of 1.80 ct. The model is limited to 666 units worldwide.